Smallest liquid sampler of the World! Miniature Sampler 2 & 10 ml sample volume! 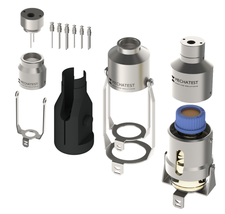 The GC Vial Liquid Sampler from Mechatest is simply the smallest and best solution to take samples specific for laboratory and chromatography applications. Direct from the process line, direct into the sample vial! This unique sampler have a reputation for reliable service and provides accurate samples of many chemical samples, solvent mixtures (particularly aqueous mixtures), but also gasoline is typical the type of sample for which this sampler is ideal. It is this type of multicomponent mixtures for a successful sampling and analysis. The GC Vial Liquid Sampler is a typical manual sampler and works with a needle in needle assembly that ensures septum integrity and full venting of process vapors. This unique needle design punctures the septum without cutting it, allowing for full resealing of the septum when the sample vial is removed and is preventing accidental spillage or needle breakage. 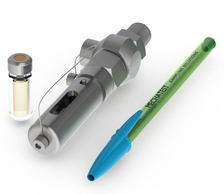 The vial sleeve is designed for small sample vials with crimp/snap top septum and assures proper alignment and safety for operation. 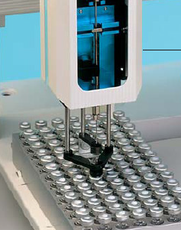 The ability to connect the sampler close to the sample point ensures optimal retrieval of a representative and contamination free sample. In spite of the low dead volume design we recommend to use the sampler in combination with a three-way valve which provides bypass configuration and allows representative product to flow true the valve and after switching directly into the sampler. The pressure drop of the flowing fluid through the sampler process needle is high, the sampler is for low pressure application else you need additional equipment to relief or reduce the pressure. Combination 3-way and 2-way ball valve gives low dead volume and possibility for bypass (circulation) sample flow The special designed needle-in-neelde allow for these small vials complete resealing of the septum when the bottle is withdrawn from the sampler. Direct sampling in small vials prevent broken needles and improve sample transfer and analysis for liquid chromatography applications. It is easier for operation and laboratory people, there is no waste, you spent sample and it is better for the environment. 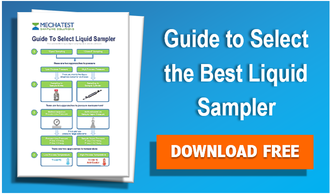 Experts within the diverse analytical disciplines have chosen the best vials, septa and accessories that meet the demands of today’s analysers, sampling and measurement techniques. 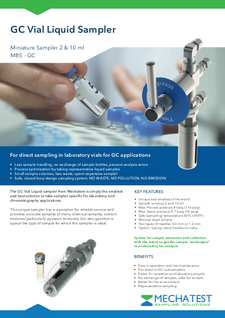 We offer with the GC Vial Liquid Sampler an unique product that fits direct to autosamplers from all major manufacturers, and that have the quality and reproducibility to guarantee a successful analysis.